It is already warm at 06:20 on the hottest day of the year as 73141 'Charlotte' leads a test train and 73201 'Broadlands' through Hersham on 1st July 2015. This time of year, with super long days, brings about all sorts of opportunities that cannot be taken at other times. This photograph is possible for just a few months as at other times of the year the sun rises on the other side of the railway. 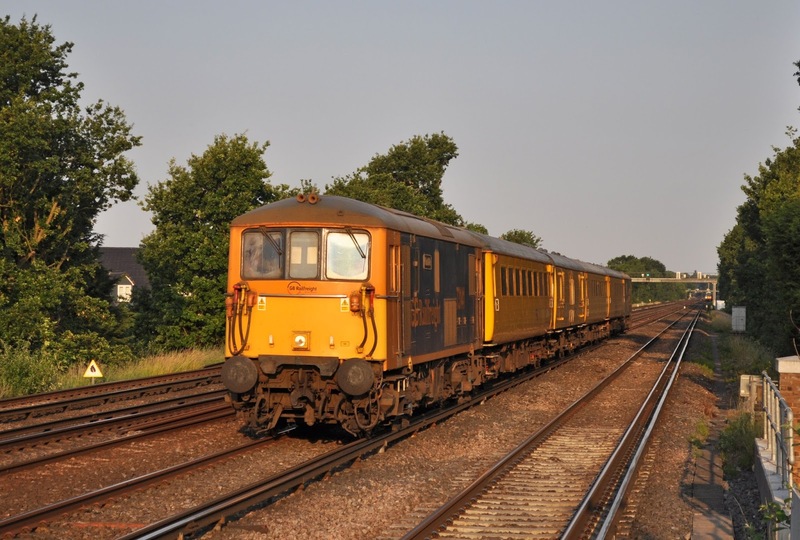 By next summer it is highly likely that the class 73/0's from GB Railfreight will have been replaced by Network Rail's own class 73/9's. The train here is seen with the first leg of its days schedule, 1Q85, from Woking to Waterloo. On the next part of the trains duty while heading down to Southampton the test vehicles developed a fault resulting in the train returning early to Hither Green.